Will Open May Sea Bass In Early April.. Going Toggin: COLD WATER BITE! SLOOOOOOW FISHING ..but some anglers will likely do OK.
Will announce more trips if weekend weather comes our favor..
A lone sea whip remains after Hurricane Sandy. This cable reef had been completely grown-over in whip, a soft coral likely zooxanthella driven. Owing to it's shallow 40 foot depth, & its location on the east side of a shoal; the reef's sea whips were ripped away in Sandy. Delaware anglers reported natural reefs in less than 90 feet of water were also affected. Whip growing on natural & artificial reefs off Delaware & Maryland's coast in 90 feet of water or more survived -- if beaten. The white patches seen here are star coral, a habitat-building hard coral that lacks zooxanthella. 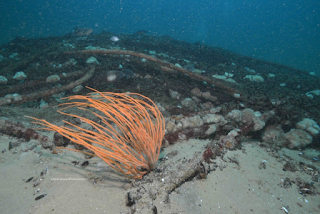 Where star coral was absent during this monitoring trip, the cable was almost completely grown-over in mussels. Snuck out three glorious days in a row last week. Fishing wasn't glorious, but the weather sure was..
Did have a bit of a bite when I could find a pocket of warm water. Some guys got skunked, others had 2 or 3 fish. We tagged 70 shorts over the period. Beats sittin on the dock. Can't wait to go again. Earlier in the week I went up to Sandy Hook for a course on Ecosystems Based Fishery Management. I really didn't expect someone to teach exactly that; no one's ever done it! Time well-spent though. Very well. Saw some our best & brightest present their work. Still, time & time again I saw where bad inputs had lead their work astray. Catch--extraction--it turns out, is brutally important to understand if regulation is going to have desired effect. Our "new & improved" catch estimates show many instances where a single state's private boats catch, in just a few weeks, what all party/charter catch in a year. Or Two. Or three, or four.. Sometimes ten. There is no cap on this sort of stupid. Catches inflated far beyond ridiculous cause obvious trouble in regulation, big trouble ..yet the focus is always on under-estimates. The "Overfishing Monster" hides under everyone's bed, ready to gobble-up the successes management keeps telling Congress about ..but we fishers never seem to enjoy. I also had a tour of the Sandy Hook Lab. Incredibly dedicated people working against an impossibly huge problem; they're given a small lab and told to fix it. I mean really. This is what the US Government is going to fix the ocean with? No wonder hardbottom reefs haven't found their way into a restorations strategy yet. . . Anyway, an event at the MREP Ecosystems course prompted me to write a letter; one I've sent broadly. I've included it below. No word from the National Academy of Sciences about a 'comment box' yet. They are investigating MRIP from a scientific angle. I know some of you would like to add your two cents. Me too.. I see change coming. Fixing estimates would be huge. Then there's a national conference in DC about artificial reefs in June. Be nice to have some real support there. "Gosh! you guys know how to grow coral? Seems I read somewhere fish like coral.."
With an honest conceptualization of habitat or, perhaps more importantly, habitat capacity; & a better idea of catch --- all we'd need then is an understanding of how to force maturity in young fish, an understanding of how to increase spawning production from available stock. Production held far above extraction is what will drive fisheries toward success. We already saw it with sea bass from 1995 to 2002. NOAA thinks that was an accident.. Instead, that magnificent period of increased sea bass population growth can be used to unlock the whole riddle. Below is a letter on one more aspect of restoration that we're blind to, as evidenced by one of the smartest people I've ever heard speak. I sent it to my State Senator, Jim Mathias, & MD DNR too.. I was at an ecosystems meeting Monday & Tuesday. Met one of the sharpest ladies ever, Dr. Sarah Gaichas. Seriously & honestly as brilliant a woman as I could ever hope to hear speak. While giving her presentation on our region's ecosystem she showed how the DE & Ches Bays had been over-run w/phytoplankton and all the yada-yadas that go with that. But then she said when those Bay waters get out, "the ocean just absorbs it." Room slam-full of scientists & concerned fishers, I paused her & explained how that's not really true. The ocean was once Blue. Now it is not. Now it is GREEN. Those fouled Bay waters are slowly but surely destroying our part of the ocean. A huge sea change dimmed by generational shift. The most powerful ocean current in the world collides with Cape Hatteras and shoots across the Atlantic. A far less powerful current than the Gulf wanders south & inshore---slow & cold---the Labrador Current. The Gulf dams DE & Chesapeake outflows. Cool nutrient-rich water allows phytoplankton to flourish. Men used to be WORRIED about catching marlin just a couple miles offshore. With surf-launched boats, those big fish ruined their gear. No laughing matter, landing fish was life. When the inlet was cut & rock-piled off, (1934) the first sport fishers targeted marlin at the 5 mile buoy. That's where "The White Marlin Capitol of the World" got its beginnings; the Jackspot made it real. Even today Jim Whaley fondly recalls winning the Marlin Club's tournament in 1958 with a pair of whites caught at the First Lump 9 miles E OC MD. Jack Kaufuer (Sp?) can recall having caught marlin just 5 miles out in the late 60s. By then, however, it was no longer common. Jackspot, at 21 NMs SE, hasn't been really good for marlin since the mid-1970s..
Marlin can only feed in clear ocean waters - blue water. Even the canyons aren't always far enough now. I saw nasty green water in the Washington Canyon last summer. Fancy boats were nowhere to be seen while we filmed hardbottom reef in 50 fathoms - they were further offshore in blue water. The worse it gets, the bigger fishing yachts get & the faster they go. Loss of oysters in the Bays is destroying our ocean's vitality..
We can fix it - must. Eventually, robbing the ocean of light & oxygen will bring fishing to a true close. I hope to build a demo reef, an artificial reef at the Tangier Reef Site, in the coming year to demonstrate what an industrial biofilter oyster-reef might look like. If we took it seriously, we might even get marlin back on the Jackspot in our lifetimes.